Jim McGuigan was born in Addiewell, near Glasgow, in 1924, and progressed through Scottish junior football to join Hamilton Academicals in 1946. After only eleven games his promise was noted by Sunderland, who brought him to Roker Park in 1947. Two years there saw the attacking wing-half presented with few chances, and he was sold on to Stockport County for £2000 in 1949. A year later he joined Crewe and found life to his liking there, to begin with; in a six-year career he appeared 208 times for the Alex, scoring 32 goals. Jim’s Crewe career ended when he was transferred to Rochdale in 1956. He felt badly treated by the Alex board but soon forged a good working relationship with Harry Catterick, then Rochdale’s manager. When the time came for Jim to hang his boots up in 1959 he was offered a coaching job at Crewe but was loath to take it, given the poor treatment he received in his last couple of seasons as an Alex player. Catterick offered him some telling advice, observing that the sort of directors who ruined his time at Crewe existed at every other League club, too, so he might as well take what was on offer! Within six months of joining the Alex’s coaching staff Jim was offered the Manager’s job, following the retirement through ill-health of Harry Ware. 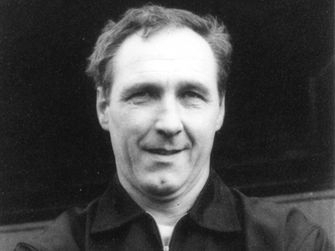 Catterick had offered another piece of advice – to turn down any offer of a manager’s job – but Jim found himself doing the job by default, so he became Crewe’s Manager in March 1960. In his first full season Jim took the side to 10th in Division Four – their highest-placed finish for ten years. In 1962-3 he led the side to a third-place finish and promotion to Division Three – a remarkable achievement at a financially poor club with a reputation for being perennial strugglers. Jim developed the ability to spot and sign a player on the cheap, and get the best out of him before moving him on at a profit. Frank Lord was one such player, whose career had hit the buffers after two broken legs but who rattled in 68 goals in his 108 games for the Alex. Crewe were relegated after just one season but this did not reflect badly on Jim. When another season on struggle unfolded in 1964-5 Jim accepted the offer of the Manager’s chair at Grimsby Town, in the not unreasonable belief that the Mariners offered more potential than Crewe. Grimsby had started well in that season’s race for promotion from Division Three but fell away badly after Christmas, to finish in mid-table. The same thing happened in 1965-6 and 1966-7. Jim worked desperately hard to rebuild the side and turn things round in a consistent fashion but, as the promotion campaign faltered in 1967 he found his two best players – Matt Tees and Rodney Green – were sold from under him, without consultation and without being adequately replaced. With his contract nearly up, and feeling that he lacked the support of his board of directors, Jim left Blundell Park by mutual consent in the summer of 1967. Both Chesterfield and Mansfield Town were looking for a Manager at the time. Jim went after both jobs. The Stags stalled while awaiting the opinion of two holidaying directors but the Spireites offered him the job at the interview and Jim accepted, principally because he’d been impressed with the town during his visits as a footballer, and fancied Chesterfield as a place to live. With little time to prepare for his first season at the Spireite helm, Jim McGuigan went into the campaign with the side that had finished 15th in Tony McShane’s last season in charge, with the addition of Frank Lord, signed for £4,000 while the team was managerless. Galvanised by Jim’s arrival the team launched a seven-game unbeaten run and were four points clear at the top on December 16th, 1966. The side could not sustain this, though, and slipped back to finish in seventh place. Still, a 98% increase in attendance pointed at the improvement brought by the Scot; the side responded to Jim’s coaching but were, in his estimation, “all played out” by Christmas. In the summer of ’68 Jim approached the board to strengthen the team. He was knocked back; they allowed him only to replace those players who had left in the closed season. Alan Humphries, Charlie Bell and Geoff Martin came in. Bell began as a forward with Sheffield United but McGuigan saw a centre-half in him; he was quite unfit on signing and was given a training regime designed to put weight on. The 1968-9 season was a distinct failure: only a late rally prevented the Spireites having to apply for re-election. McGuigan was not surprised; he’d seen a proper tilt at promotion as being three years away, with the team he inherited, and wisely, the board kept faith with him. The struggle of ’68-9 convinced the board of the need to strengthen, but they must have been delighted when McGuigan told them he only wanted three new men for the 1969-70 season. He named his three: midfielders John “Dan” Archer (Huddersfield,) Tom Fenoughty (Sheffield United) and Luton’s forward, Ian Buxton. In the event Buxton was lost to the higher wages paid at Notts County but the other two came, and the need for a forward disappeared when Ernie Moss emerged to partner Kevin Randall. Fenoughty had been playing up front but he was moved into midfield and the team clicked. They went to the top of the table in December but stayed there this time, winning the club’s first promotion since 1936. Jim McGuigan was named as the Bell’s Manager of the Year for Division Four. Jim’s team easily held their own in the Third Division but began to struggle as players came to the end of their careers. He was not allowed to spend more than £10,000 on a player but quality was beginning to come at a higher price. By 1973 his own salary had increased by only £15 a week over the six years he’d been at Chesterfield. That summer, he asked Dan Newton, who had taken over as Chairman after the death of Harold Shentall, for pay rises for six long-serving players. Newton’s brusque refusal pulled the rug from under Jim’s feet, and he resigned. Other sides knew what we were losing and within days he was appointed Manager at Rotherham, for whom he won promotion. He left after Anton Johnson became involved at Millmoor and went to Stockport, where boardroom squabbling prevented any success, before concerns about his health forced his retirement in 1982. As the definitive “Player’s Manager” he was someone you could look up to, a father figure to a young lad just starting out in the game; if you’d been around the game a bit, you respected the fact that he treated you like an adult. With hindsight, Jim saw leaving Chesterfield as a massive wrench: “This was the club for me,” he later said, “the club where I wanted to be, and the only place my family settled. There was no way I wanted to leave,” he added, “and I would have stayed here happily for the rest of my career if the club had treated me right.” One can only wonder how far the club might have got, if it had. A it was, Jim’s untimely death in 1988 caused fans of a certain age to pause, and remember with gratitude the achievements of the man who rescued the club from twenty years of torpor.